"PHYSICAL DEATH I DO NOT FEAR BUT DEATH OF CONSCIENCE IS A SURE DEATH"
Sant Jarnail Singh Bhindrenwale was a (and to some extent still is ) Sikh hero of modern times. He was born in the family of Brar-Jatt Baba Joginder Singh and Mata Nihal Kaur of the village Rode in Faridkot District. Baba Joginder Singh was a farmer of moderate means. Bhindrenwale was youngest of the seven brothers. After primary education took up farming in his village. He engaged himself in farming until 1965 when he joined the Damdami Taksal of Bhinder Kalan village, about 15 km north of Moga, then headed by Sant Gurbachan Singh Khalsa. Hence the epithet Bhindrenwale. But his association with Bhinder village was only notional because Sant Gurbachan Singh, though associated with Gurdwara Akhand Prakash at Bhinder Kalan, usually took out his group of pupils on prolonged tours. Jarnail Singh underwent a one-year course in scriptural, theological and historical studies, at the hands of Sant Gurbachan Singh Khalsa partly during one of his tours but for the most part during his stay at Gurdwara Sis Asthan Patshahi IX, near Nabha Sahib village, 15 km south of Chandigarh along the Chandigarh-Patiala road. In 1966, he rejoined his Family and settled down to farming again. He was married in 1966 to Bibi Pritam Kaur, daughter of Bhai Sucha Singh of Bilaspur, and had two sons, Ishar Singh and Inderjit Singh, born in 1971 and 1975 respectively. He continued his religious studies and also kept his close association with the Taksal, which after the death of Sant Gurbachan Singh Khalsa, in June 1969, was headed by Sant Kartar Singh Khalsa, who established his headquarters at Gurdwara Gurdarshan Prakash at Mehta Chowk, 25 km northeast of Amritsar along the road to Sri Hargobindpur. Sant Kartar Singh khalsa was killed in a road accident. Before his deadh on 16 August 1977, he had mentioned the name of Sant Jarnail Singh as his successor as the new head of Damdami Taksal. Sant Jarnail Singh was formally, elected at the bhog ceremony in honour of Sant Kartar Singh Khalsa at Mehta Chowk on 25 August 1977. He had a meteoric rise to fame and his photographs began to be avidly displayed on the front pages of newspapers and journals across the continents. Trained in a Sikh seminary to preach the holy word of the Gurus, he stood face to face with history at several critical moments. Bhindrenwale within his seven brief years of a total of 37, marked by a precipitous course, emerged as a man of extraordinary grit and charisma. Soon he came to be talked about in the far-flung academe as well as in political forums. Sant Jarnail Singh exhibited remarkable enthusiasm in carrying out his missionary responsibilities. The primary task he addressed was the administrating of amrit (Khanda Baate da Pahul) . He vehemintly denounced drugs, alcoholic drinks and trimming of hair. He took special notice of the Nirankari heresy Which was undermining the Sikh Structure. Opposition to the Nirankaris had started during the time of his predecessor, Sant Kartar Singh Khalsa. Matters camee to a head on the Baisdkhi day of 1978 when Nirankaris held a convention at Amritsar. The Damdami Taksal under Sant Jarnal Singh Bhindrenwale and the Akhand Kirtani Jatha, another purely religious organization, protested against government allowing the Nirankaris to hold their convention at a time the Sikhs were celebrating the birth anniverssary of the Khalsa. Some of them who marched to the site of the convention were fired upon by Nirankari guardsmen killing 13 of them on the spot and wounding 78 others. The episode brought Sant Bhindrenwale into the political arena. He was more against the Akali Dal which was then leading the government in the Punjab and was partner in the central authority in Delhi. On 4 january 1980, two days before the Lok Sabha poll, all the 64 Nirankari accused, including their chief Gurbachan Singh, being tried for the killing of Sikhs, were set at liberty, by the sessions judge of Karnal in Haryana. This bittered Sant Bhindranwale. The media in the Punjab took the part of the Nirankaris on the pica of' secularism. So did the Congress party which, on returning to power at the Centre, dismissed the Akali government in the Punjab, where too fresh elections were held and Congress government installed. On 9 September 1981, Lala Jagat Narain, a press baron of jalandhar, highly critical of Sant Bhindrenwale, was assassinated. The Sant too had been a strong critic of Jagat Narain. The government suspected the Sant's hand in the murder and issued warrants for his arrest. He was then on a preaching tour in Haryana and was camping at Chando Kalan village in Hissar district when a combined force of Punjab and Haryana police raided the village to nab him. He himself escaped to the security of his own headquarters at Mehta Chowk, but the police fired upon his jathd or band of disciples; their baggage was looted, and some of the sacred texts burnt. The Sant offered himself for arrest on 20 September 1981. This was followed by, a spate of violence. The Sant was released after the Central Home Minister, Giani Zail Singh, declared in the Parliament on 14 October 1981 that there was no evidence against him to show his hand in Jagat Narain's murder. The Sant had seen through the Congress conspiracy loaded against the Sikhs. His arrest and Subsequent release raised the Sant's stature among the Sikh community who, especially the youth, judging hitu against the moderate Akali leadership, flocked under his banner in ever increasing numbers. The Sant became increasingly outspoken. The governnient took notice of the change in Bhindrenwale's stance and proceeded to take action against him. An attempt Was made to arrest him while he was on a visit to Bombay was staying in the Singh Sabha Gurdwara at Dadar on 20 April 1982, but Sant Bhindrenwale was again able to reach safely in the Gurdwara at Mehta Chowk. On 19 July 1982 the police arrested Bhai Amrik Singh son of the late Sant Kartar Singh Khalsa and president of the All India Sikh Students Federation. Another senior member of thc Damdami Taksal, Bhai Thind Singh, was arrested on the following day. Sant Bhindrenwale felt highly provoked. Feeling that sanctuary at Mehta Chowk was not safe enough, he moved to the Guru Nanak Nivas rest house in the Darbar Sahib complex in Amritsar on 20 july and called for a Panthic convention on 25 july at which he announced thc launching of a morcha (campaign) For thc release of his men. Meanwhile., the Shiromai Akali Dal had been conducting a morcha since April 1982 against the digging of Satluj-Yamuna Link (S.Y.L.) canal which would divert part of Punjab's river waters to Haryana. The agitation inspite of immense support from the Sikh peasantry was not bearing any tangible fruit because the site (Kapori village on the Haryana-Punjab border where the Indian Prime minister had inaugurated the digging of the canal on 6 April 1982 was in a remote corner away from the Dal's headquarters. The Dal now decided to transfer the agitation, now designated Dharam Yuddh or religious war, to Amritsar from 4 August 1982. Sant jarnail Singh merged his own morcha with it, and thus became in a way the joint dictator of the entire Panth though he still swore loyalty to the former dictator of the Akali morcha, Sant Harchand Singh Longowal. A further provocation to the Sikhs came from the behaviour of the Haryana government and police during the Asian Games held at Delhi in November 1982. Sikhs travelling from Punjab to Delhi or back were indiscriminately stopped, searched and humiliated. Violence in the Punjab was on the increase. It was becoming more and more clear that the government would seek a military Solution of the situation in Punjab rather than a political one. 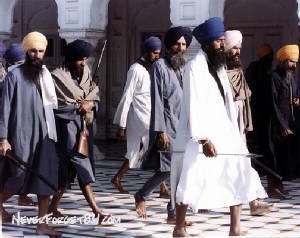 Sant Bhindranwale exhorted the people to be prepared for a showdown. On 15 December 1983, he with his men entered the Akal Takht and With the help of a former major general of the Indian Army, Shahbeg Singh, prepared a network of defensive fortifications inside the complex collecting in the meanwhile a large stock of arms, ammunition and rations anticipating the possibility of a prolonged siege. The government on its part made elaborate plans for all army action while pretending all along its readiness for negotiations and denying any intention of sending armed forces inside the Darbar Sahib complex. The Punjab was placed Under the President's rule on 6 October 1983. A ordinance declaring parts of the state a disturbed area was promulgated, and the police was given power to search, arrest or even shoot whom they will with immunity from legal action. Six additional divisions of the army including especially trained para commandos were inducted into Punjab by the end of May 1984. On 1 June, while the Sikhs had started preparations in the Golden Temple for the observation of the martyrdom anniversary of Guru Arjan, which fell on the 3rd of June, strict curfew was clamped on Amritsar and surrounding districts. The actual assault of the army's operation nicknamed Blue Star took place on the night of 5-6 June 1984. A pitched battle ensued in which the army also used tanks and artillery. On the 7 Of June the dead body of Sant Jarnail Singh Bhindranwale was located in the basement of the Akal Takht.